Many business owners have good startup ideas for building music apps. If you are one of them here’s a guide on how to make a music application. Speaking about a music app we should remember that there are different types of it which are designed for various purposes. Music Streaming apps - they deliver music to the users without the songs to be downloaded from the internet on your device. The well-known apps like Spotify and Pandora belong to this category. Music Player apps - in contrast to the previous type these apps should be downloaded on your device. The users can make their private music collections, play audio files etc. For example, these are iTunes, Windows Media Player and RealPlayer. Music Identification apps - they identify songs and singers the users want to figure out. The most famous music Identification apps are Shazam, SoundHound and TrackID. Music Download apps - with their help the users can download music. These are Freegal Music, Beats Music etc. Music Making apps - these are software for music production. You have the ability to mix your vocals and create new melodies eith the help of these apps. There are many popular apps like Garageband, Songify, Animoog. Cloud Storage. With this model the users can store music, songs and stream anywhere and anytime. Theme Radio Station. It helps to choose a definite radio theme or themes and listen to only chosen options. Music Library. The user can create his own music library. Then he offers access to it to other customers, sometimes this access is paid or partially paid. Firstly, you have to decide what type of a streaming app you plan to develop. Secondly, decide upon the features you need to see in your app. Remember to place “must-have” features to your music application and add some new ones. The variety of music is concidered to be one of the most important feature of music streaming services. There are “must-have” features which are presented in every music app. Additionally, every app should have unique features and come to the market with them. There are several options. One of them is to use your music app without signing up. Another one is to make a quick and comfortable signup/signin via your personal social media platforms, like Facebook, Instagram, etc. Instead of social networking sites, there can be registration via email or phone numbe, which helps to monetize an app. It provide a customer with the ability to create his/her own account and make personalize playlist and get access to paid features. 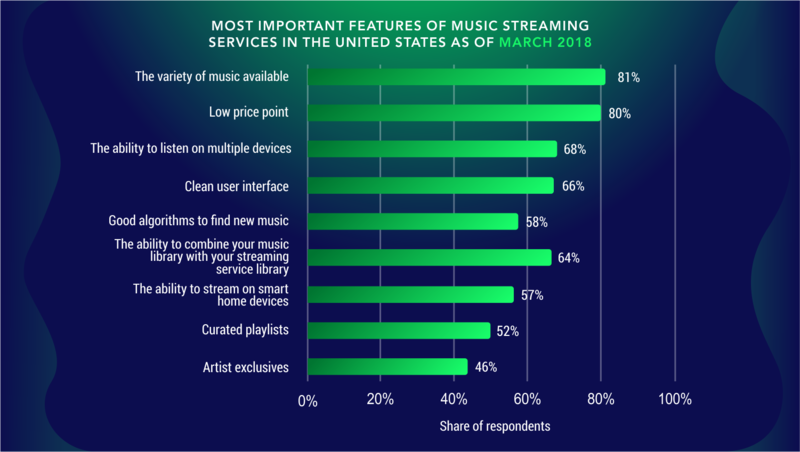 Users surely want to find new songs and new favourite tracks. Think of proposing them new songs based on the categories and singers they like. There is an option to make other categories like Top songs, Most popular, The newest tracks etc. You should give your users the option to store songs, albums, to add them to their libraries. Actually, almost all music apps provide this option. This feature helps to make your app well-known. Users like to share music they are listening to in social media so that other people can check it, too. This is a good chance to create recognizable app. The online mode is important for sharing tracks or for downloading music. The offline access is important when the Internet is slow or there is no Internet connection at all as well as the cases when users save bandwidth. This option allow users can store music and listen to it from their library. There are other features which are not that relevant but still can make a significant difference to your app. We have collected following additional options for you to take a look and analyze whet will be the best one for your future app. It is a great idea to let users discover more details about the song,album and a singer/band. For example, it might be quite interesting to know general info about the singers or the band, details about the song and video creating process, details about the whole album etc. Offer the lyrics of the song and display it while the users are listening to the song. Additionally, create the possibility to get a translation into their native language for more profound uderstanding the message of the song. Taking that into account, people who are learning the foreign language will be grateful for this feature. Option to record own songs, to upload these songs and to add music to separate libraries. Some songs the users like may be absent in your playlists and the users should have a possibility to add their favourite tracks. It’s a very desired option because each user has ever set his favourite song as a new ringtone. Option to view the video of the song on the Internet. This option will entertain the users. People can watch their favourite artists while listening to the song. It would be great to add a “Shazam” option to your streaming app. It will be a real life-saver for someone who heard the favourite song without knowing the name and the artist. Let's face it, we all have been there. Precisely in this case, this feature will identify the name and the artst so the user will enjoy the new discovery. Music app development is a good idea for your new project. Before you get started a lot of preliminary work has to be done. We advise you to do the market research of streaming apps and define the "must have" features that will be the core of your app as well as the additional ones that will make your app unique. We tried to give some pieces of advice to simplify the streaming music app development for you. In case you have some coding knowledge you can build the app on your own. If not than feel free to contact our skilled team and get the top-notch product.